Niraamaya Retreats has added another property to its portfolio of awe-inspiring destinations marking its third retreat in Kerala. Nestled on the banks of the famed Lake Vembanad in the Kerala Backwaters in Kumarakom, Niraamaya Retreats Backwaters & Beyond, is now open for bookings. The newest Niraamaya will provide its guests glimpses of an authentic insights into the local Keralean life while instilling a sense of peace and wellness through its natural landsacpe and a range of wellness offerings. Set amidst eight acres of lush tropical gardens, the retreat houses 27 luxurious villas designed to maximize the glorious views of the lake. Meandering pathways lead to tasteful living spaces that are in complete harmony with nature amidst breezy coconut palms and tropical foliage. The retreat also features a large 25m pool and a performance deck apart from two restaurants designed to become gastronomical destinations offering some of the finest regional as well as global cuisine in the Kerala Backwaters. Essence - the specialty restaurant will offer regional specials and signature oriental cuisine with a collection of the finest wines. CafÃ© Samsara, the all-day dining destination will serve authentic Kuttanad cuisine as well as global cuisine with fresh made-to-order breakfast. A key feature of all retreats, Niraamaya's renowned wellness concept will provide holistic rejuvenation and relaxation in a serene and meditative setting. The multi-award winning Niraamaya Spa will deliver a range of wellness offerings including International, traditional Ayurvedic therapies, tailored wellness immersions and Yoga. 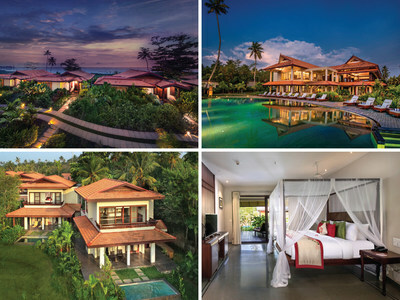 On the launch of the property Manu Rishi Guptha, CEO, Niraamaya Retreats said, "I am very excited to unveil the Niraamaya Retreats Backwaters and Beyond. This is our third property in Kerala and we intend to open two more resorts in Fort Kochi and Munnar to have a well-defined wellness circuit in Kerala. We, at Niraamaya, create wellness programmes using all the 5 pillars of wellness which are Rest & Rejuvenation, Nutrition, Movement, Yoga, and Mindfulness. Generally, an Ayurveda programme is for 14-20 days but using our in-house expertise we have launched short interventional Ayurveda programmes starting from 5 days. Our next phase of growth is to have Retreats in Rajasthan & North East. In Rajasthan, we are trying to develop a circuit amongst the cities such as Jodhpur, Udaipur, Jaipur, and Bikaner and in the North East we would like to have a similar circuit by opening resorts in cities like Calcutta, Shillong, Kohima, and Sikkim." Superior Lakeview Villas: Perched on a level above ground, these elegantly appointed premium villas offer stunning vistas of the backwaters from its private balconies. These unique villas offer multiple views of the pool, lagoon as well as the lake, from different locations of the villa. A walk-in wardrobe, powerful body showers complete the luxurious pampering touches. Luxury Private Pool Villas: Located on the ground level, these luxuriously styled villas open out to the very own private plunge pools and a sun-drenched deck. These villas offer verdant views of the lush tropical gardens and/or pool views and are only a short walk from the backwaters or the swimming pool. No detail has gone overlooked with regards to the plush interiors; other indulgences include, open-to-sky bath gardens, walk-in wardrobes and powerful body showers. Premium Waterfront Villas: These ultra-luxurious villas flaunt their exclusivity by way of uninterrupted views and direct access to the serene Lake Vembanad. The guests can watch inspiring sunsets at the private sun deck or listen to the soothing ripples of the backwaters from the privacy of the deck loungers. Private plunge pools and luxurious four-poster beds angled to face the lake perfectly tempers the waterfront indulgences. Each villa also offers walk-in wardrobes, luxurious open-to-sky bath gardens with rain showers and indoor bathrooms with options of a bathtub in few villas. Presidential Suite: Located on a level above ground with exclusive access through a private elevator, this elegantly appointed sprawling 2-bedroom luxury suite offers stunning views of the backwaters. Opulent yet gracefully styled, the Presidential Suite has been designed for ultimate indulgences in the most remarkable setting overlooking the lake. The Suite features a dining area, pantry, bathtub and private balcony overlooking the serene backwaters. Evenings are spiced with Kerala's classical theatre, dance, music and other performing arts with scenic houseboat cruises on the lake to explore the flora and fauna. Dining by Design: Dine at breathtaking locations around the retreat curated to serenade loved ones and create cherishing moments. A special al fresco dinner, set up with a Chef and Butler in attendance, at any of the special venues - the deck overlooking the lake, a candlelight dinner in a houseboat or by the sprawling lawns under the night sky. Cooking Class with the Chef: Niraamaya Culinary School was set up with an aim of bringing together and preserving traditional regional recipes. Learn signature dishes from the Executive chef and explore the rich culinary heritage of the region. Tea by the Lake: Niraamaya Backwaters & Beyond overlooks the famed Lake Vembanad, making it romantically private. The tea setup can be arranged by the lake either at pre-dawn with the first rays of the sun, or for high tea in the evening, where the guests can watch the golden sun sink into the horizon. Shikara Boat Ride through Backwater Canals: The guests can enjoy a small traditional boat ride, that takes them through a network of canals in and around Kumarakom. Soak in the sights and sounds of the riverine culture of the paddy growing area of Kuttanad as the boat rides through the lush green landscape. Experience Houseboat Cruise: Enjoy the quintessential backwater cruise on Lake Vembanad aboard a luxurious houseboat or 'kettuvallam'. The relaxed cruise offers a chance to ride the placid waters of the lake and glimpses of rural life in the Backwaters. Kumarakom Village Life Experience: The Kumarakom backwaters allow travellers to get a flavour of rural life in Kerala. The direct interaction with local culture, traditions and livelihood activities such as coconut palm frond weaving, screw pine making, or fishing offer a peak into the village life. Kerala by Design: Embark on a journey across Kerala with a curated itinerary featuring luxurious stays at Niraamaya retreats, sensory experiences, culinary delicacies and cultural immersions. Niraamaya is a family of exclusive private retreats that offer transformational experiences for a sensory journey. A Jupiter Capital venture, Niraamaya Retreats is in the business of boutique hospitality and wellness. The retreats are an embodiment of wellness and luxury, operating in India's most sought-after destinations, designed with craftsmanship that offer the stillness and charm of a peaceful retreat and pride of experiencing contemporary hospitality, integrating a seamless blend of regional heritage and culture presenting to its guests what is uniquely Niraamaya Experience.